With this post, we’re beginning a series of articles about features and details of the MultiCAD.NET API for creating and modifying table entities. For many drawings, tables are indispensable: they’re used to present descriptions, specifications, and instructions for creating construction elements represented in a drawing. 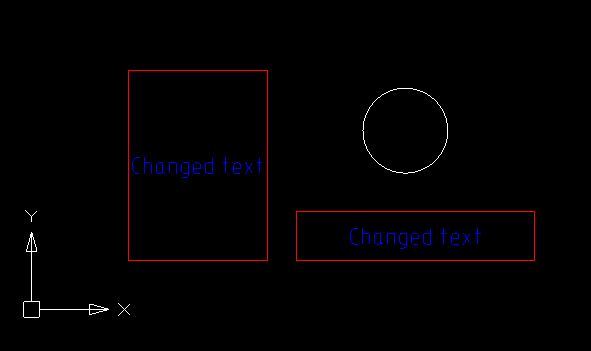 It’s common to create tables based on properties extracted from drawing objects. Automating this process can save time and reduce errors. breaking the entire table into a number of pages and inserting the pages. 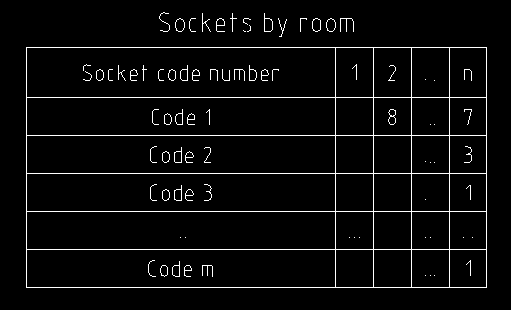 Each cell value represents the number of sockets of a specific code in a specific room. Also, the table contains a page header that could be added for each page and a header for the first page with the table’s title. Users will be able to change the suggested table’s structure and cell formatting in the table editor. 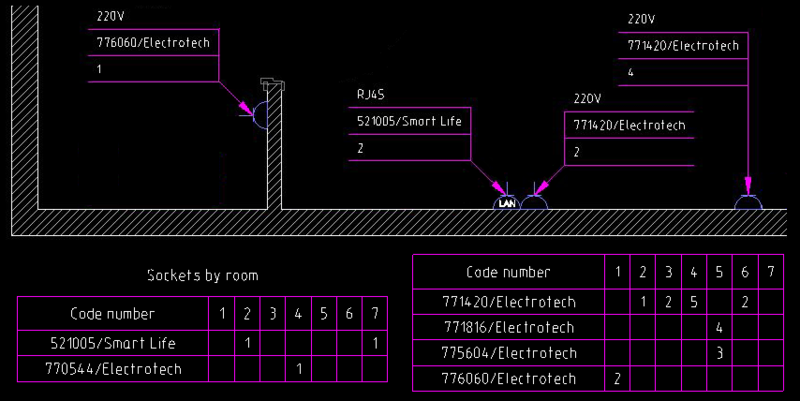 This implementation of the table contains cells with special string identificators: #code and #room. These strings help to find the correct place for the data when the table is being filled. This ensures the table will be filled properly even if the numbers of rows or columns are changed. 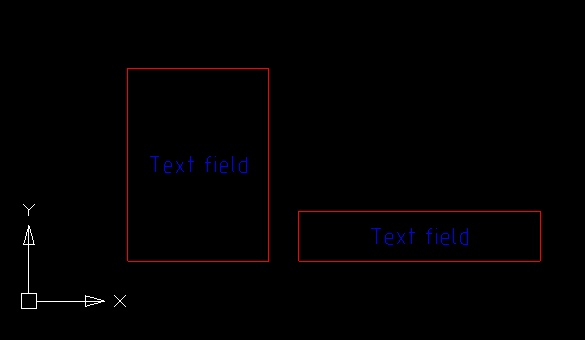 To simplify filling up the table, all text data should be arranged in an single structure that supports searching and sorting operations. Here the following structure of nested dictionaries is used: <product_code<room_number, count=”">>. Let’s assume that the template is already created and saved to an external file (for example, C:\template.dat file) using the CreateTemplate() method. Now the saved table can be loaded using the McTable.LoadFromFile() method. 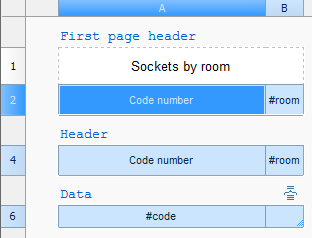 Let’s create a table object, read the saved table into it and launch the table editor. It’s important to note that the table must be saved in a format that can keep the table’s structure and formatting, as well as its contents. After that we can switch to filling up the table. The process includes sorting data received from the notes strings and adding them in appropriate cells. There is a quite wide list of possible implementations, one of which you can find in the example’s source code. MultiCAD.NET contains an effective ability to divide a table into multiple fragments without losing its integrity. It’s used to split a large table in order to place it on a smaller sheet of paper, while still being able to edit it as a whole. To insert a page breaks by maximum page height the McTable.PagesTable.SetPageHeight() is used. Like any MultiCAD application, the example can simply run in nanoCAD after loading the example’s assembly and calling the registered smpl_CreateTableReport command. To run the MultiCAD application in AutoCAD, it’s required to use the special Object Enabler application. It’s important to note that the standard MultiCAD Enabler for AutoCAD (which is available in the nanoCAD Developers’ Club) doesn’t support objects from the Multicad.Symbols namespace. For running applications that deal with such objects, SPDS GraphiCS or MechaniCS (that contain full set of primitives including table and note entities) should be launched first. This entry was posted in General on March 31, 2014 by DevClub. In the previous post we discussed the process for creating custom entities in the MultiCAD.NET API, and described the CustomObjects example from the SDK. In this post we’re going to focus on the issue of selecting custom entities of the same type in the drawing. We’ll extend the code for the CustomObjects example by adding functionality to searching for one or more of these entities and changing the text for each of them. Both methods allow the user to select an object based on a prompt shown in the command line. The second method adds an additional parameter for the coordinates of the selection point. The first method selects drawing objects using a specific filter, the second one shows a prompt in the command line and allows the user to pick objects by themself. The second method allows the user to select entities manually instead of using filters, but we need to make sure the user has selected only entities of desired type. This entry was posted in General on March 28, 2014 by DevClub. One of the key disadvantages of classical .NET APIs in .dwg-compatible CAD programs is that it is impossible to create custom entities in .NET. Custom entities must be created in C++ with managed C++/CLI wrappers to be usable in .NET . Our MultiCAD .NET technology provides the ability to create custom entities within the bounds of managed code. In addition to not requiring intermediate C++ objects, MultiCAD .NET uses standard .NET mechanisms, so there is no need to manually serialize objects, create COM objects, or perform other overhead chores that are typical with CAD programming. 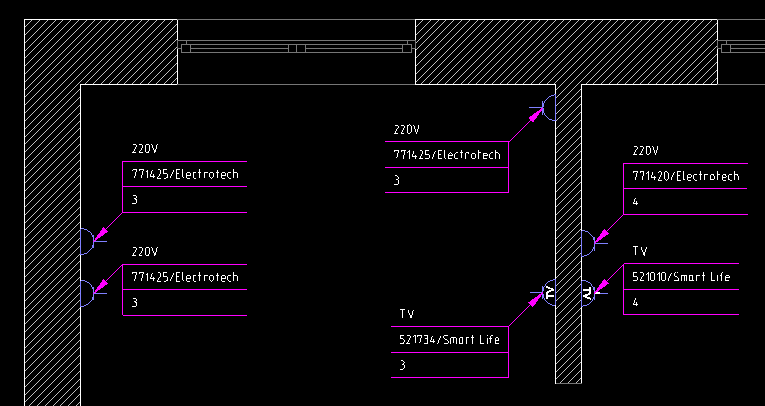 A drawing containing this custom entity can be opened by any .dwg-compatible CAD program. The entity can be modified by loading an assembly, containing the entity’s code. The same assembly can be correctly loaded to all supported CAD platforms without recompiling. 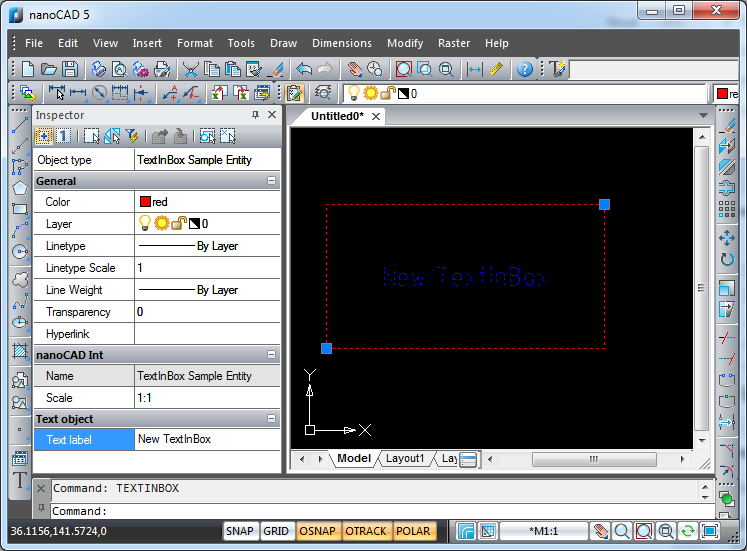 MultiCAD .NET technology runs natively in nanoCAD, and works in AutoCAD (and other compatible CAD programs) through an Object Enabler extension module, which can be downloaded in the nanoCAD Developers’ Club. [Serializable] attribute allows for using the standard serialization mechanism from .NET Framework. 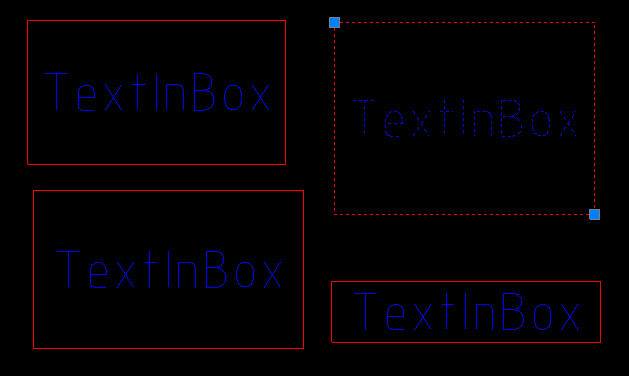 The methods from the base McCustomBase class for drawing entity geometry, adding into the database, selecting, and modifying the object are overridden by the TextInBox class. The OnDraw() method is used for drawing the object. This method uses the GeometryBuilder class as a parameter. 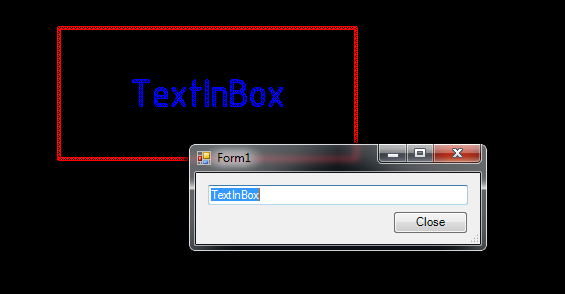 public InputResult GetPoint(string prompt) — gets a point on the drawing from user input. The prompt parameter is used to show a prompt. public EventHandler MouseMove — the mouse movement event handler, used for monitoring mouse motion and interactive object redrawing. public virtual void OnMoveGripPoints(List indexes, Vector3d offset, bool isStretch) — the grip points moving event handler. public virtual void OnTransform(Matrix3d tfm) — defines object transformations. 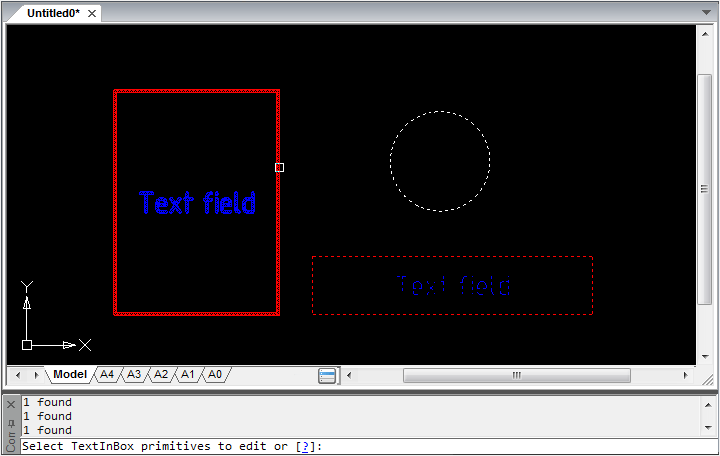 public virtual hresult OnEdit(Point3d pnt, EditFlags lInsertType) — the object editing event handler. The indexes parameter is a list of grip points indexes, and offset is a grip points displacement vector. //Save Undo state and set the object status to "Changed"
CategoryAttribute — defines the name of the category for the property. In this example, we have created a custom entity that can be added to the .dwg drawing and standard modifications for CAD users. This set of entities’ features can be extended as well. In later articles we’ll talk about creating entity versions by adding new fields and by renaming (removing) existing fields, and discuss the specifics of entity versioning in MultiCAD.NET API. This entry was posted in General on March 27, 2014 by DevClub. Welcome to nanoCAD API blog. The blog is dedicated to nanoCAD programming and customization and intended for sharing information about using different kinds of our APIs for CAD application development. Here you will be able to find up-to-date information about our products, technical details, how-to solutions and of course sample code. If you have any suggestions or ideas for blog topics, please feel free to put them forward in comments or at developer_support@nanocad.com.